Many workers receive an audiogram (hearing test) at some point, especially if they are in a hearing conservation program, but what do the results mean? 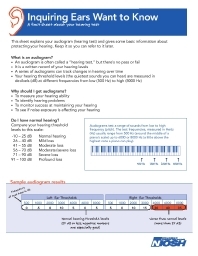 This single page (two-sided) fact sheet contains important answers to frequent questions workers ask about their audiograms. It addresses why workers should get regular audiograms, how to understand the results, and why the results should be saved to help evaluate and maintain the worker's hearing. It also has some basic information on the causes of hearing loss and how to prevent it. Enlace a la versión en español de la portada.